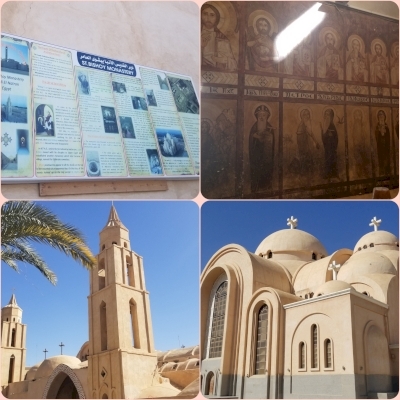 The monasteries of the Arab Desert and Wadi Natrun is part of the Tentative list of Egypt in order to qualify for inclusion in the World Heritage List. There are four remaining monasteries according to the documentation. The documentation is old and hard to make sense why the place is unique. I suppose because of the setting and old age, having survived over a thousand years. I went to see two of these at Wadi Natrun: St. Macarius and St. Bichoy (or Bishoi if you want to follow the odd docs). If you have a car then you should visit them on your journey west to Cairo rather than towards Alexandria like I did - the U-turn-based road system will cost you a lot of time. Also the map (Google, can't blame them really) pointed us right through a private road that stopped at a factory. Being nice and friendly, the great guy at the blockade offered to have a staff member join the tour and guide is THROUGH the factory to end up at the end other end, saving as almost 40 minutes driving!! As I took the bus back from Alexandria I had no choice but to visit them as I was going west. Another word of advice: try not have a Muslim driver! No, well, you can't really be picky about this and shouldn't - but the monasteries are paranoid and it took really long to sort this out with the police who eventually escorted us out of the area. I suppose, again, you can't blame them entirely but overall in Egypt this paranoia is a problem. So finally, let's talk about the monasteries: entry is free and they are really happy someone came to see them having a nice chat before I could finally go inside. Most of the stuff on display are fancy clothes and jewelry, kind of what I see in European churches too, especially Catholic ones. The architecture is unique for the area but even the modern churches I saw had this style - I suppose that DOES make it special if it was a trend-setter so long ago. Also you can visit the churches themselves but not all are open. The ones that are could be in better shape, the altars are still original and everyone touches it (for religious reasons). Could see this make the WHS list if the documentation is updated and there are clear indications why it is unique and special. Just having some great religious icons once living here with his disciples isn't good enough in my opinion, else we would have Lincoln's wood cabin etc all on the list (although Gandhi, Mandela and a few others are being groomed for the WHS list already which I think is another problem altogether).